Salves, Balms and Lotions, Oh My! Now that our herb gardens are rocking, I thought I’d give you all a tutorial on how to make an herbal salve, a lip balm, and a basic lotion. 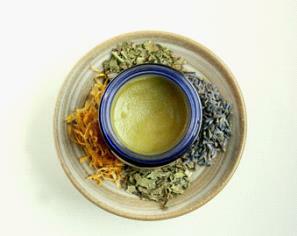 To make a basic salve, all you need is an infused oil, beeswax and some essential oil. Infused oils are carrier oils that have been “infused” with one or more herbs. 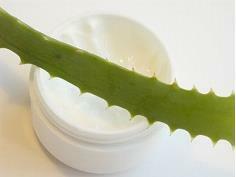 They are used to make any oil-based apothecary items, such as lip balms, creams, massage oils and salves. You can use any oil to make a salve, I personally like infused oils of calendula, comfrey, chamomile, plantain and arnica etc. However, sweet almond, grapeseed and even olive oil are all good choices. To make a 4 oz jar, use two ounces oil to one ounce beeswax or a two to one ratio for a semi hard salve. All you need do is combine the two and microwave until the beeswax melts. One melted stir well, add any essential oils you like and stir well. Pour into jar. It will firm up in about 15 minutes. 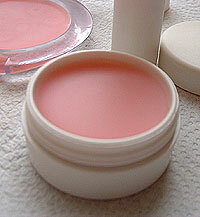 Lip Balm is very similar to making a salve. Instead of a two to one ratio of oil to wax it’s a four to one. After melting the wax into the oil, you can flavor it with any candy confectioners extract, vanilla extract etc. If you happen to have a liquid sweetener you can use that as well. I often times like to color my balms. 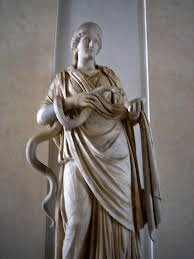 I use FDA approved micas so if using micas, note, a very tiny amount goes a long way! This mixture will have to be stirred for approximately 5 minutes or so to combine all the ingredients or they will separate. Fill pots or if you have tubes, fill those. Lotions are a bit more difficult to make but the end result is wonderful! Now all lotions need an emulsifier such as beeswax, however that makes for a greasy lotion so in this case we’re going to use borax (yes it’s an all natural product found in the laundry aisle of your local supermarket) and shea butter. You’ll need: 1/2 cup boiling water, 1/8 teaspoon borax, 1/2 cup of almond oil and 1 tablespoon shea butter. Boil the water and add the borax, stir, and set aside. Melt the oil and shea butter and then pour into a blender. On low speed start pouring in the water to the oil mixture in a very thin, slow stream. Blend on high until well mixed. You should now have a milky white lotion. Makes 4 Ounces.